I didn’t really want another dog, as I was perfectly happy with the one we already had. Sandy was a sweet-natured and happy dog who fit in beautifully with our family, and I felt that one dog, a long-haired rabbit who required daily brushing and a gerbil were more than enough for me to take care of. But the kids really wanted another dog, so I foolishly told them that once the gerbil and rabbit were gone, we could get a second dog. Unfortunately, within six months after I said that, the gerbil and rabbit both died. Which is how Lucy came into our lives. When we found her at the Humane Society, she seemed to be a calm, friendly dog who got along well with Sandy, so we signed the adoption papers, handed over a check and took her home. The next day, we were surprised to discover that our new dog had suddenly seemed to acquire a very high level of energy indeed. Closer inspection of her adoption papers revealed that we had adopted her less than twenty-four hours after she’d been spayed, which was a mistake none of us caught at the time. That explained the “sudden change” in her personality. She hadn’t been calm when we’d met her at the shelter; it was just that the sedation hadn’t completely worn off. But by that time, she was already of member of our family and returning her was out of the question. 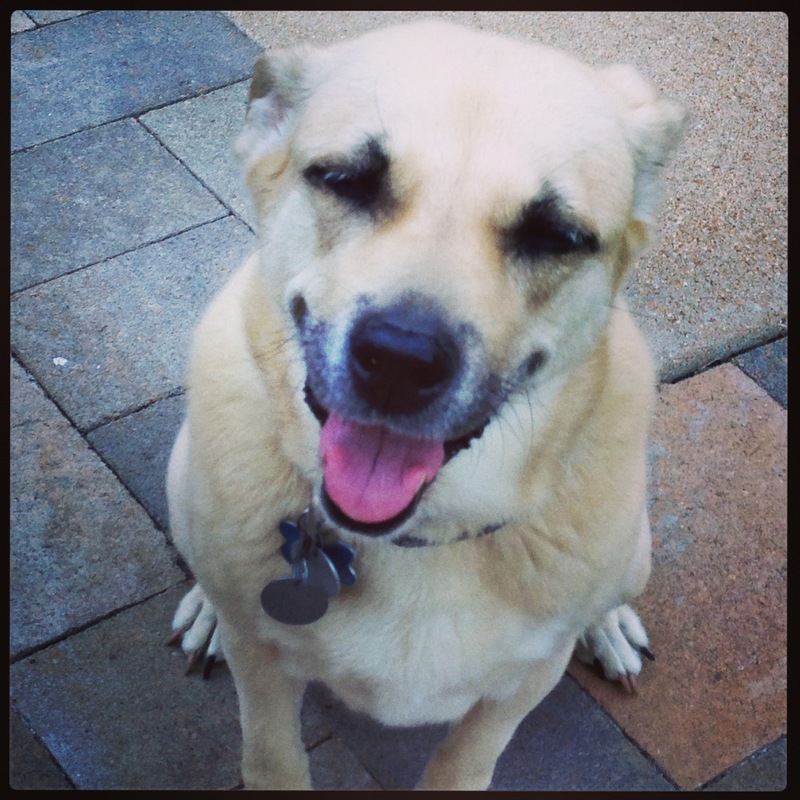 We quickly learned that Lucy was easy to love, but not so easy to live with. We discovered that she not only had extraordinary energy, but was also very independent and unbelievably smart. Sadly, her intellect has never been matched by a desire to please, or to abide by the household rules. Lucy lives by her own rules. She raided trashcans, even the ones with lids, which meant that she was constantly supplementing her diet with used kleenex and other disgusting things she couldn’t digest properly. I’ll spare you the gross details. She left muddy footprints in our bathtubs, strolled casually across the living room window sill, and waited patiently for the exact moment when no one was looking to jump on the table and polish off the cheese ball during a party. She prided herself on keeping our backyard squirrel-free, and would also leave us little tokens of her love on our back porch: a piece of charcoal, a chunk of our landscaping border, a dead vole. Staying one step a head of Lucy required constant vigilance, and even then, I wasn’t always successful. I guess I thought I’d be glad when Lucy grew older and slowed down a little. But I’m not. She’s thirteen now, and has been an only dog since last September, when our beloved Sandy died at the age of sixteen. Lucy seems a bit lost without her, and after Sandy’s death, she has aged much more quickly. These days, the dog who was so independent and afraid of nothing trembles when I drive her to the vet, and sticks close by me when I’m home. The dog who always launched herself enthusiastically at our household visitors doesn’t even hear the doorbell any more, and the dog who once had boundless energy is happy to spend most of her time sleeping in a patch of sunlight, especially if I am nearby. I may be middle aged, but Lucy is old, and there’s no escaping the fact that she is beginning to fade away. Her hearing is almost completely gone, she’s getting cataracts and sometimes she seems bewildered and confused. I know she’s “just a dog” to many people, but those who truly love their pets will understand that I am just not ready for this particular loss. Maybe its because we’re still adjusting to life without Sandy, maybe I’m still feeling the effects of the empty-nest syndrome, or maybe I’ve just known too many people who have died in the past few years. But for whatever reason, I sometimes sit with Lucy and quietly whisper to her, “Stay.” She’s smart enough to know what I mean. Ann this is a very beautifully written piece. It is so poignant and touching, especially to those of us who are avid dog lovers. They can touch your heart like nothing else can. I know you miss Sandy still and probably some of the pep that Lucy once had. 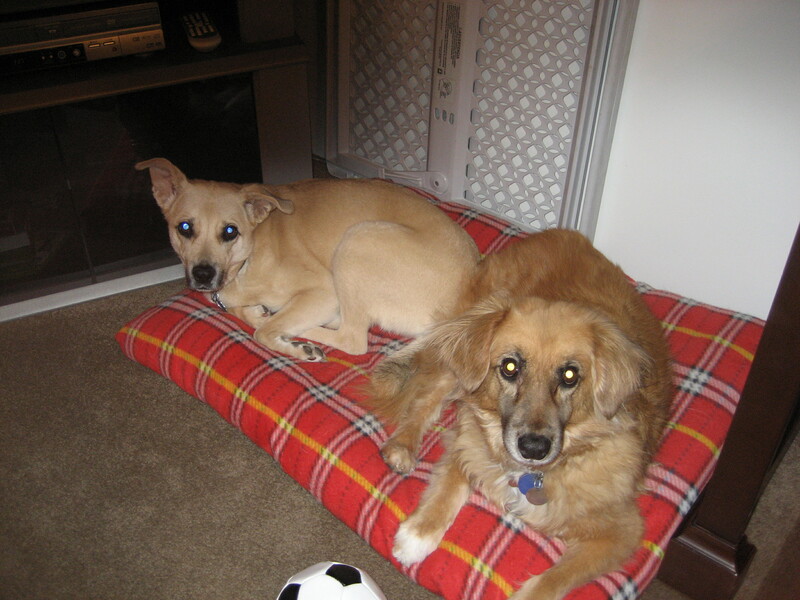 Your dogs have had such wonderful lives living with you and could not have wanted for anything more. Thank you, Dianne! Your kind words mean so much! Beautiful. Just beautiful. I can honestly empathize. Love to you & beautiful Lucy. Thank you! And thanks for writing such touching posts about your dogs, too! I am so glad I found your blog! There’s nothing I can say to soothe…except to note the obvious…Lucy got Lucky. I could hardly finish reading through the tears. If they would only live longer.